Perched atop the iconic One New Change, Madison enjoys a unique vantage point above the city and offers spectacular views of some of London's most cherished landmarks including St Paul's Cathedral, the London Eye, Tate Modern and The Shard. 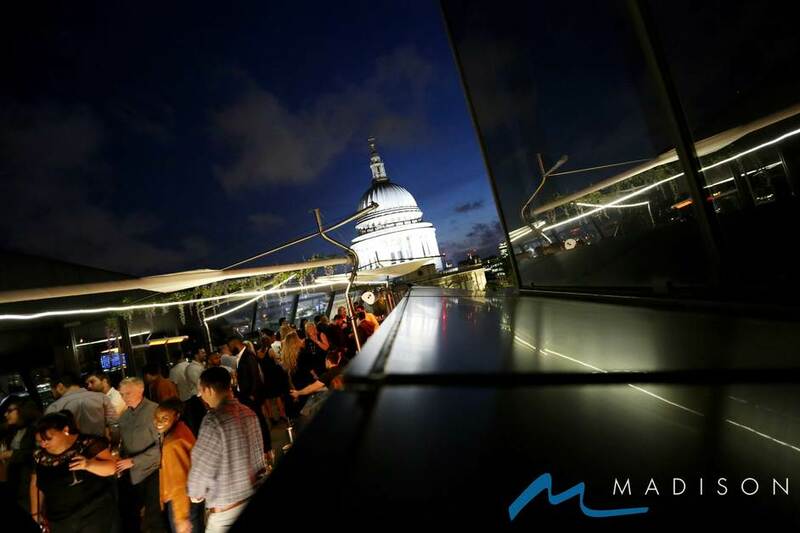 As well as one of Europe's largest public open air roof terraces, Madison brings together a restaurant, rooftop terrace and an al fresco bar. The restaurant serves modern and classic European cuisine alongside high-end comfort food, with dishes such as slow cooked curried pork belly, tuna tataki a triple duck burger. The terrace bar and lounge, meanwhile, serve snacks such as truffle fries, buttermilk chicken and sautéed king prawns. Daytime drinking and social gatherings are also possible at Madison as the rooftop bar and views ally together to create a unique drinking experience. Glammed up guests and pumping music make it a place to see and be seen with the prices to match - a glass of wine will set you back between £6 and £10 while half a pint costs an eye-watering £4.50. Madison gyms, sporting activities, health & beauty and fitness. The best pubs near London Madison. Madison clubs, bars, cabaret nights, casinos and interesting nightlife. Where to have your meeting, conference, exhibition, private dining or training course near Madison. From cheap budget accommodation to luxury 5 star suites see our special offers for Madison hotels, including Club Quarters St Pauls Hotel from 78% off.